The 32.9 metre motor yacht Aynur’a, listed for sale by Onur Erardag at Nautique Yachting in Turkey, has been sold in an in-house deal. 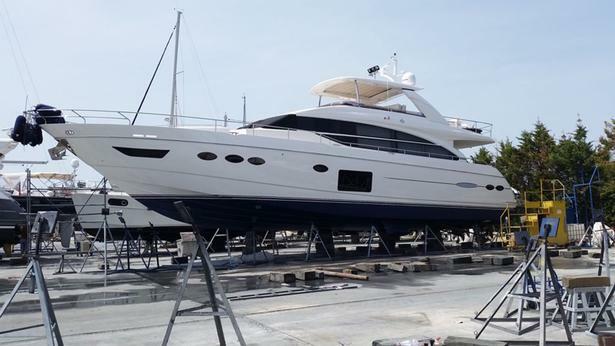 Built in GRP by Italian yard Ferretti to a design by Zuccon International Project,Aynur’a was delivered in 2016 as a Custom Line 108 model with all the options. RINA classed, she accommodates 10 guests in five cabins comprising an owner’s suite on the main deck, two VIP suites and two twin cabins, all with entertainment centres and en suite bathroom facilities. A further three cabins sleep five crewmembers. A large and comfortable saloon, with panelling in American walnut, has a lounge area with ample seating on settees arranged in a U-shape, a bar and an entertainment centre including a satellite television screen, while forward is a dining area with seating for 10 guests around a glass-topped table. The aft upper deck is fully equipped to cater for al fresco entertaining and dining, with a table, chairs, sun loungers and sun pads. Up on the flybridge more outdoor space is offered, along with attractions including a bar, bar stools, a Jacuzzi tub and a Bimini top providing welcome shade from the sun. Twin 2,639hp MTU diesel engines give her a cruising speed of 23 knots topping out at 26 knots and she is fitted with Trac digital fin zero speed stabilizers for anti roll comfort at sea and in port. For a boutique brokerage house, Nautique Yachting has had a remarkable run of success this summer, having already sold the Benetti Lalika, Akhir Enki and Sanlorenzo Blue Agave in the past two months.